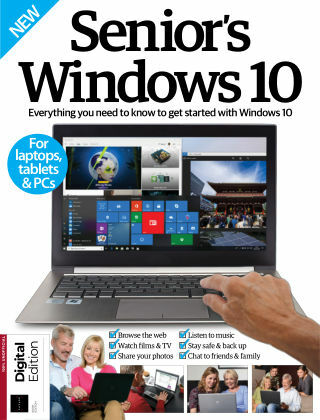 With Readly you can read Senior's Edition Windows 10 and thousands of other magazines on your tablet and smartphone. Get access to all with just one subscription. New releases and back issues – all included. Windows 8 saw a radical departure from the familiar and user-friendly formula that preceded it – much to the distaste of many. Well, Microsoft listened, countering complaints with the release of Windows 10 in 2015. In this latest operating system, the Start menu makes a welcome return with the tiled system integrated into it. Internet Explorer has been replaced by Microsoft Edge, with its fancy tricks for annotating web pages, creating reading lists and browsing the internet. Then there’s Cortana, your very own built-in, voice-powered personal assistant. Senior’s Edition Windows 10 will help you find your feet with Windows 10 with handy guides to all the essential features and functions.